Valproic acid is a type of drug which is useful in treating patient with myoclonic seizures, generalized tonic clonic seizures and absence seizures as well as migraine prevention and bipolar disorder. Valproic acid acts by increasing the concentration of the GABA. Valproic acid will inhibit the enzyme which supposes to metabolize the GABA. Valproic acid may lead to hyperpolarization of the cell membrane of the neuron by affecting the movement of the potassium ion and sodium ion across the cell membrane of the neuron. Valproic acid should be avoided in patient who is pregnant. Valproic acid is contraindicated in pregnant woman due to its teratogenic effect such as neural tube defect in the fetus. 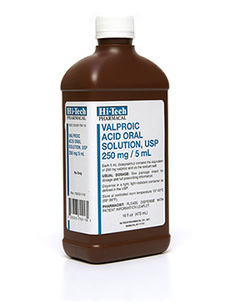 The common side effects of valproic acid include nausea, hepatotoxicity, sedation and thrombocytopenia.